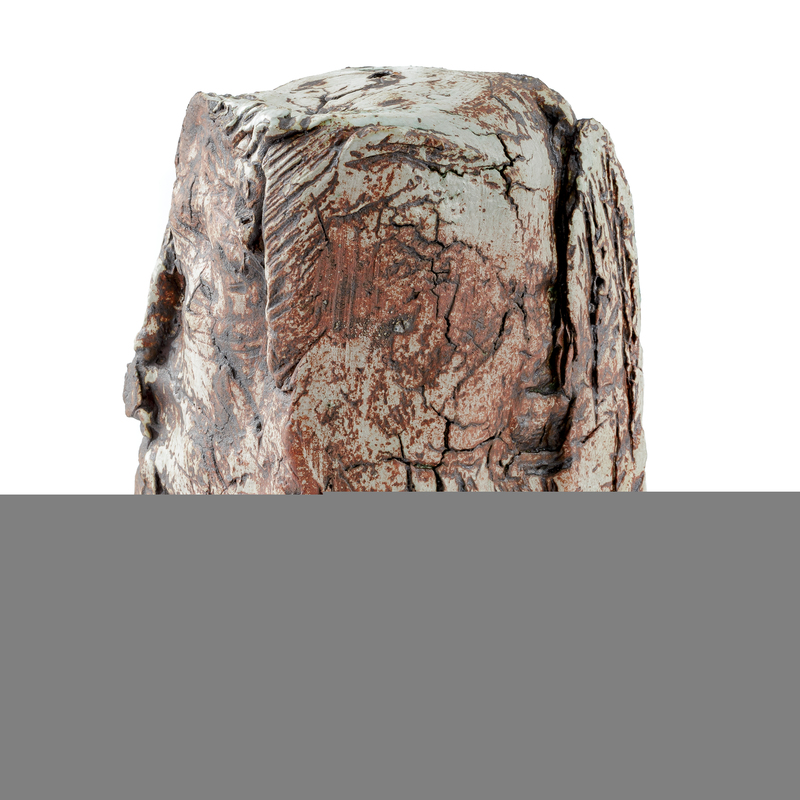 Exquisite as a contemporary sculpture, this irregular-shaped ceramic lamp base is made in clay with experimental enamels created by the craftsman so as to obtain particular material and “scratched” colour effects. 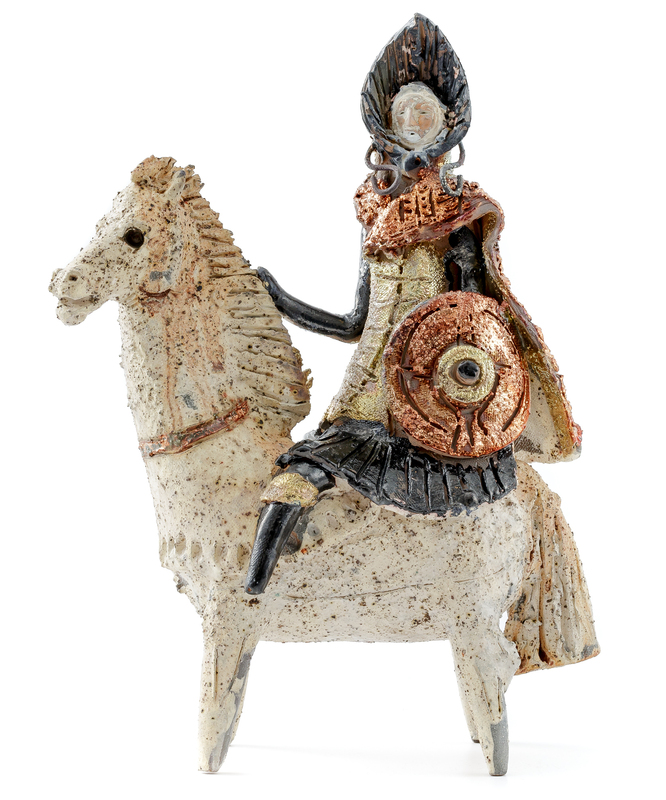 The regal figure of the warrior on horseback, in ceramic, enamelled so as to create fine chromatic effects and iridescent gold shine, distinctive of Franco Scassellati’s production, is inspired by the archaic Nuragic culture rendered with a dynamic style. 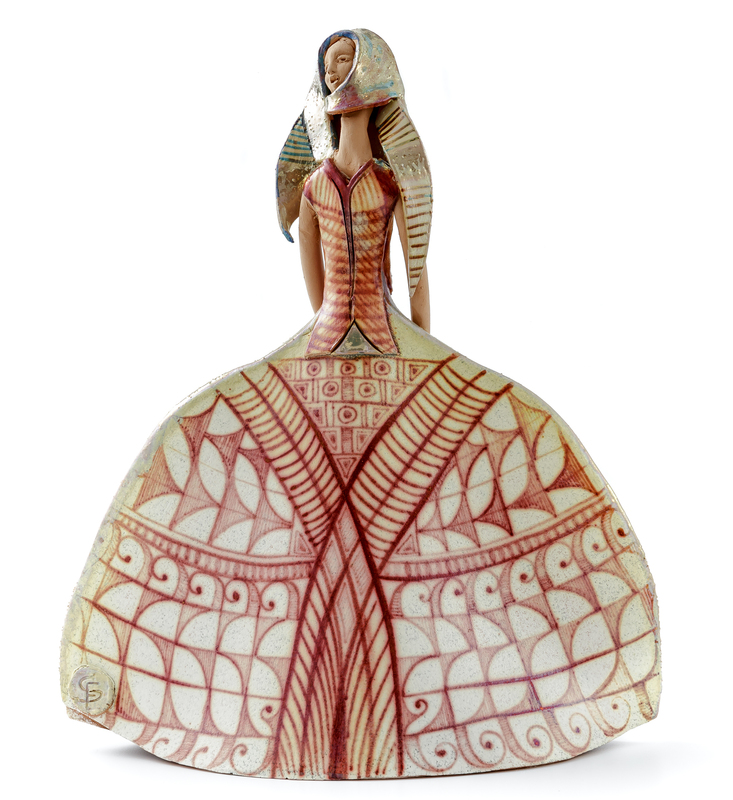 The fine sinuous sculptural silhouettes of women in glazed ceramic revive the traditional Sardinian costumes for women by means of decorations and elegant motifs, which also recall the Umbrian majolica as a dedication to the origins of the ceramist’s father. 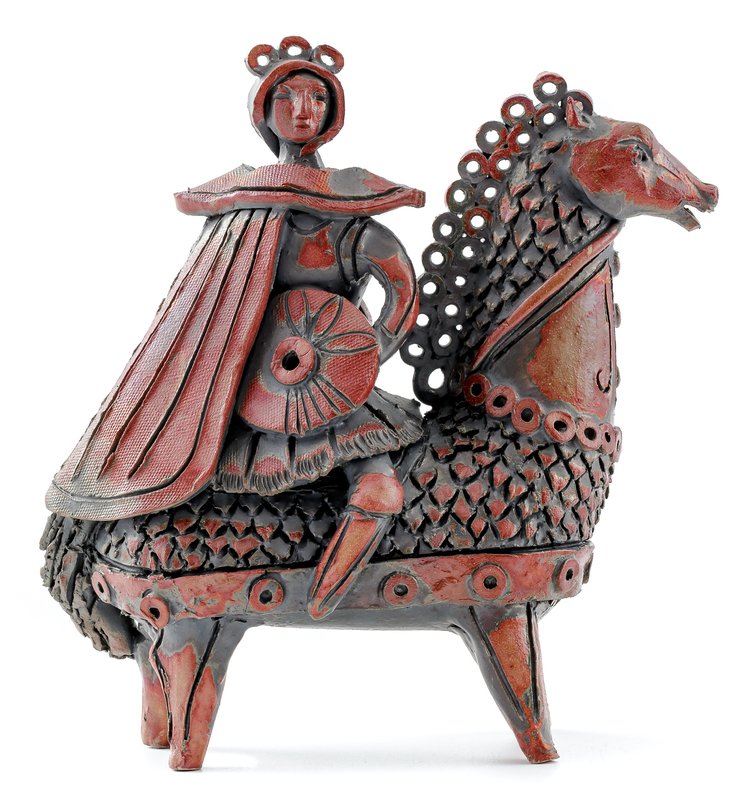 The figure of the warrior on horseback, distinctive of Franco Scassellati’s artistic production, is inspired by the archaic Nuragic culture, expressed with dynamic style and refined sculptural technique. 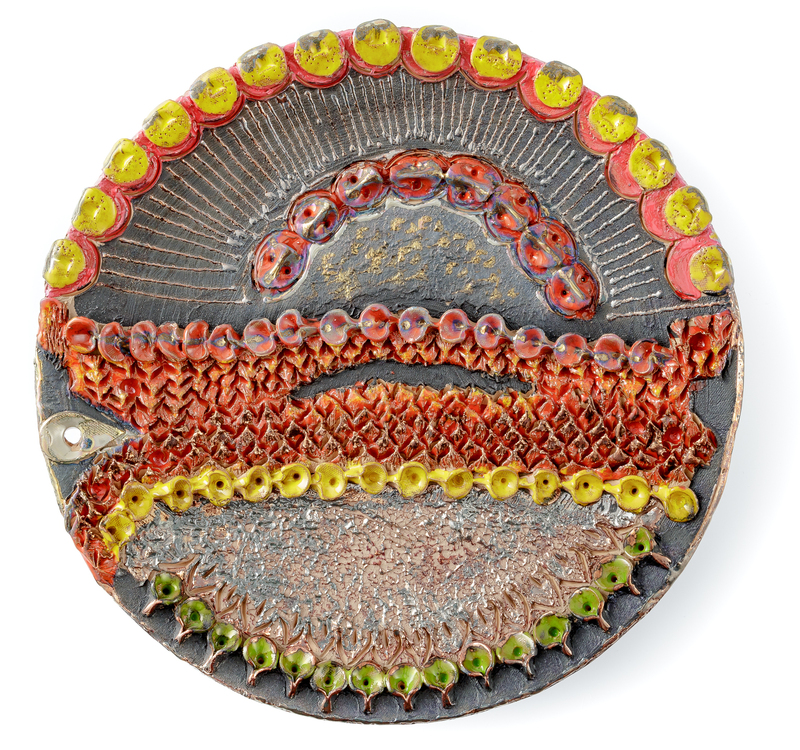 This large ornamental ceramic plate a sculpted surface with an abstract motif, combined with fine colours and textures resulting from the skilful use of clay and enamels created by this craftsman. Franco Scassellati’s eclectic and renowned production of artistic ceramics stands out for its experimental style used to explore different themes, reciprocally combining figurative and abstract styles, all recognisable through his ever-evolving colour code. A fifth-generation ceramist, Franco grew up in the creative atmosphere of the large well-equipped workshop of his father, a skilled craftsman from Umbria who had moved to Sassari in the early 1950s and who actively participated in the vivid re-launching of local artistic ceramics, working as a master potter with Eugenio Tavolara for the organisation of modern Ceramic courses where some of the most important Sardinian ceramists-to-be were trained. Franco, throughout his long and interesting career, with the invaluable support of his wife Rossella, preserves the family tradition with his striking artistic flair, the keeper of skills and decorative motifs rooted in established know-how that draw on the sophisticated Renaissance-style Umbrian ceramic tradition that enable him to experiment shapes and colours in an exclusive production free from styles and fashions. His artefacts are part of numerous public and private collections, recognised and sought after for their distinctive aesthetic value. He currently works tirelessly to craft experimental items, participating in numerous national and international exhibitions where he represents the excellence of the art and crafts of the island. In his large workshop in Sassari he collaborates and works with his daughter Monica and his grandson Jacopo, united by equal creative sensitivity and artistic talent, expressed through a distinctive personal touch. Franco Scassellati’s artistic production counts mainly ceramic sculptures depicting Sardinian themes with harmonious combination of styles that recall the Renaissance-style Umbrian ceramics in decorations and techniques, a distinctive feature of his well-defined artistic personality. The fine shapes of the Janas and those of the Nuragic Warriors are decorated with sophisticated iridescent colours, obtained with gran fuoco firing procedures that lend the enamels ever-changing fine glitter effects. Alongside this production, a unique line of large plates, decorative vases and other home décor accessories with plastic surfaces and colours and enamels produced by this workshop and processed according to personalised procedures. Another distinctive line is the white tableware set with engraved decorations, which is made up of a wide range of dinner services and other tableware, entirely handcrafted and glazed using enamels made especially to be used with food. In Franco Scassellati’s ceramic workshop, in line with his experimental approach, the materials used are mainly handcrafted, from clay to enamels, moulded and used with exclusive manual technique and fired with gran fuoco (high-firing) procedures.